Assessing and Anticipating Threats to US Security Interests: A Bio-Psycho-Social Science Approach for Understanding the Emergence of and Mitigating Violence and Terrorism. Author | Editor: Giordano, J. (Georgetown University Medical Center). This white paper represents the work of intra- and extramural subject matter experts (SMEs) from multiple disciplines, convened to provide views and insights to define and further develop a bio- psychosocial approach to understanding, assessing, and influencing the cognitions and behaviors of individuals and groups that are devising, recruiting, training, and implementing organized aggression and violence. In light of current national and international security concerns, a major focus of this report is upon those bio-psychosocial factors that are influential to, and influenced by the activities of the group known as Islamic State of Iraq and the Levant— ISIL (or Daesh/Da’ish). Over the past four years, ongoing activities of the Strategic Multilayer Assessment (SMA) group have focused upon the validity and viability of neuro-cognitive techniques and technologies to be operationalized within national security, intelligence, and defense initiatives. Operationally, neuro-cognitive approaches have been, and are being evaluated, and in some cases iteratively employed, in the assessment, analysis, interdiction, influence, mitigation, and/or deterrence of factors contributory to intent and acts of global aggression and violence that threaten the United States (US) and its allies. Through these projects, it was recognized that the value of neuro-cognitive techniques and technologies are best—and in some cases only—realized if and when they are incorporated and employed within (and to optimize) a more expansive orientation to human thought and action, which encompasses, appreciates, acknowledges, and engages the interactive dynamics of humans-in-environments. 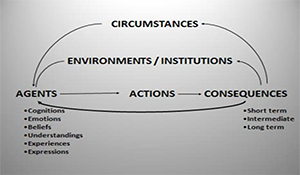 This approach is known as the bio-psychosocial model, with homage to George Engel, who developed this paradigm—originally in reference to the scope and conduct of biomedicine—to describe humans as biological organisms, who psychologically experience and respond to the social (i.e., physical, group, economic, political) environment(s) in which they are embedded and function. 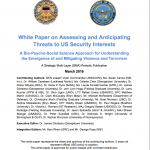 This whitepaper, Assessing and Anticipating Threats to US Security Interests: A Bio-PsychoSocial Science Approach for Understanding the Emergence of and Mitigating Violence and Terrorism represents the work of intra- and extramural subject matter experts (SMEs) from multiple disciplines, convened to provide views and insights to define and further develop a bio- psychosocial approach to understanding, assessing, and influencing the cognitions and behaviors of individuals and groups that are devising, recruiting, training, and implementing organized aggression and violence. In light of current national and international security concerns, a major focus of this report is upon those bio-psychosocial factors that are influential to, and influenced by the activities of the group known as Islamic State of Iraq and the Levant— ISIL (or Daesh/Da’ish). Following the Introduction and Review of Related SMA Projects, each section has been developed in a way such that the reader may delve into each/any of the sections to gain both an overview and subsequently more finely-grained, detailed insight to (biological, psychological, and/or social) aspects of individual and/or group aggression and violence. In keeping with the core principles of the bio-psychosocial model, these sections are interactive and reciprocal. The reader need not proceed in any particular order, but may elect to begin with any section, so as to gain understanding of how and why certain (biological, psychological, or social) dimensions affect, and are affected by others. In each chapter, reference is made to information in/of other chapters, and the reader can use these references as direction to find related and supportive information. The final section of this report affords an overall operational perspective. Thus, if and when taken either in part or in sum, this report will provide a working view to the ways that bio-psychosocial variables—and a bio-psychosocial approach—are important to understanding aggression and violence, and informing and articulating national security, intelligence, and defense efforts to analyze, deter, and/or prevent its incitement and occurrence.